Bud Flesher was born in 1932 in Weston, West Virginia. He enlisted in the U.S. Air Force on April 10, 1951, and after completing basic training at Sheppard AFB, Texas, he completed Radar Mechanic training at Keesler AFB, Mississippi, in April 1952. His first assignment was as a radar mechanic with the 4113th and then the 43rd Armament and Electronic Maintenance Squadrons at Davis-Monthan AFB, Arizona, from April 1952 to April 1953, followed by acceptance into the Aviation Cadet Program, where he earned his commission as a 2d Lt and his pilot wings at Bryan AFB, Texas, on July 22, 1954. Lt Flesher next completed F-86 Sabre Combat Crew Training, and then served as an instructor pilot with the 3626th Combat Crew Training Group at Tyndall AFB, Florida, from March 1955 to February 1957. His next assignment was as a Flight Test Maintenance Officer at Tyndall AFB and then at Moody AFB, Georgia, from February 1957 to September 1960, followed by an Air Force Institute of Technology assignment to Oklahoma State University to complete his bachelor's degree from September 1960 to April 1962. Maj Flesher then served as a Flight Test Maintenance Officer with the 4603rd Air Base Group at Stewart AFB, New York, from April 1962 to January 1965, and then as a Jet Aircraft Scheduling Officer with the 1st Fighter Wing at Selfridge AFB, Michigan, from January 1965 to March 1966. His next assignment was as an F-4 Phantom II pilot with the 78th Tactical Fighter Squadron at RAF Woodbridge, England, from March to October 1966, when he deployed to Southeast Asia. Maj Flesher served as an F-4 pilot with the 480th Tactical Fighter Squdron at DaNang AB, South Vietnam, from October 1966 until he was forced to eject over North Vietnam and was taken as a Prisoner of War on December 2, 1966. After spending 2,271 days in captivity, he was released during Operation Homecoming on February 18, 1973. LtCol Flesher was briefly hospitalized to recover from his injuries at Travis AFB, California, and then completed pilot re-qualification training at Randolph AFB, Texas. His final assignment was as an F-106 Delta Dart pilot with the 84th Fighter Interceptor Squadron at Castle AFB, California, from March 1974 until his retirement from the Air Force on September 1, 1976. 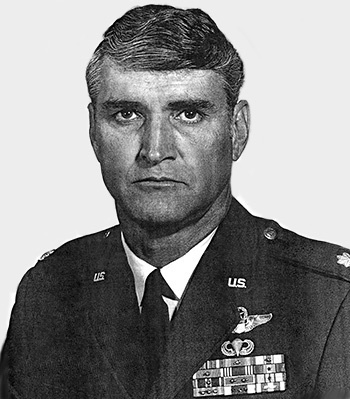 Captain Hubert K. Flesher distinguished himself by gallantry in connection with military operations against an opposing armed force over North Vietnam on 25 November 1966. On that date, on two separate missions, he conducted air to ground operations against a heavily defended surface to air missile convoy that had been discovered moving South toward the Demilitarized Zone. On the second mission of that day, Captain Flesher's aircraft was hit by hostile ground fire, but he continued to press multiple attacks until his ordnance was expended, then with complete disregard for his own safety and completely defenseless, Captain Flesher continued to make multiple dry passes against the defenses drawing enemy ground fire away from the other aircraft in his flight. This courageous and aggressive act against overwhelming odds resulted in the destruction of an important target. By his gallantry and devotion to duty Captain Flesher has reflected great credit upon himself and the United States Air Force.